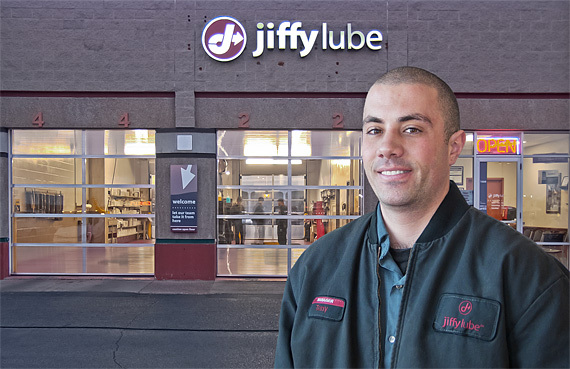 The new owner of Jiffy Lube franchises in Mankato and Rochester, Tony Chahine (pronounced Shuh-HEE-nee), was raised in a close-knit, middle-class family in Los Angeles where dad had a security-related job and mom stayed at home. 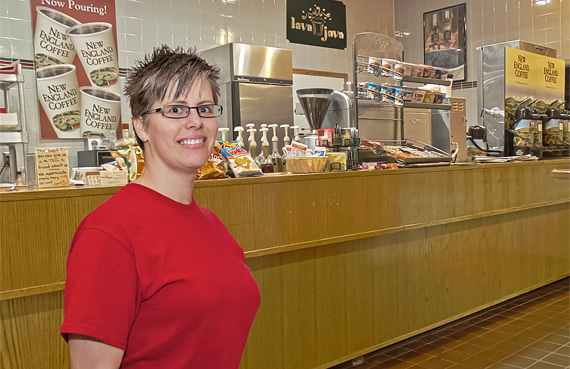 Owner Kay Prescher said in a telephone interview, “I was always the person that wanted to be around everyone and make them feel happy.” The 38-year-old Wells native’s business, Lava Java, opened within the last year in the downtown Mankato Mall. Several Connect Business Magazine readers have inquired about sursum ad summum, the phrase I have been placing atop my signature below. Translated, this Latin means, “Rise to the Highest,” and was the official motto of my Ohio high school, Walnut Hills. 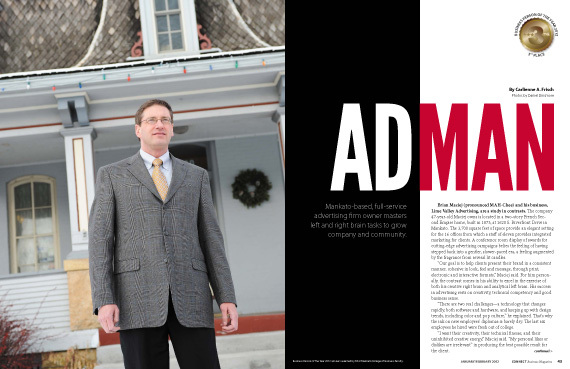 Before starting my editorial yarn, I first have to thank our panel of Minnesota State College of Business professors for choosing our 2012 Business Person of the Year, an honor shared this year by North Mankato kettle corn moguls Dan and Angie Bastian. 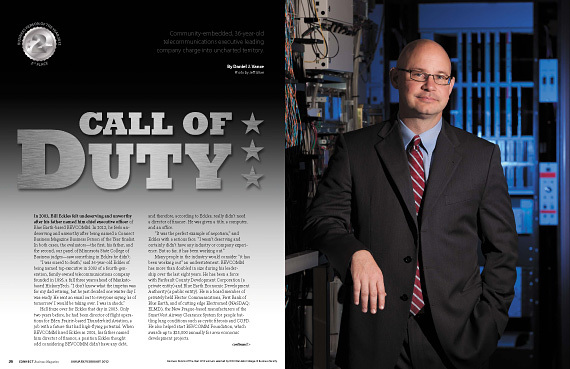 Brian Maciej and his business, Lime Valley Advertising, are a study in contrasts. The company 47-year-old Maciej owns is located in a two-story French Second Empire home in Mankato. The 3,700 square feet of space provide an elegant setting for the 16 offices from which a staff of eleven provides integrated marketing for clients. 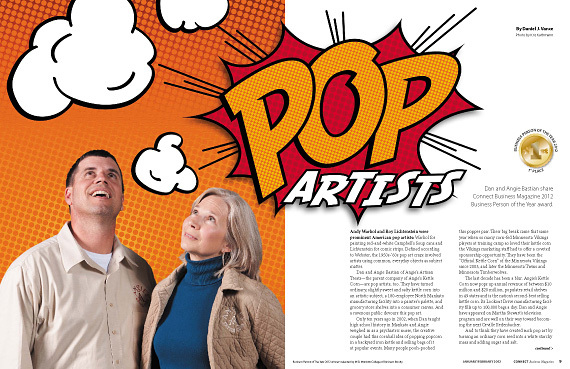 Dan and Angie Bastian of Angie’s Artisan Treats—the parent company of Angie’s Kettle Corn—are pop artists. They have turned ordinary, slightly sweet and salty kettle corn into an artistic subject, a 180-employee North Mankato manufacturing facility into a painter’s palette, and grocery store shelves into a consumer canvas. And a ravenous public devours this pop art.